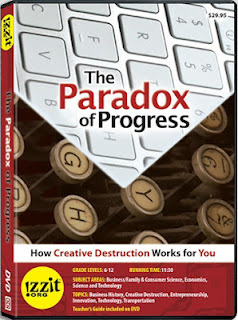 We've just released our 3rd new DVD of the year, The Paradox of Progress. This teaching unit examines the idea of "creative destruction," focusing on how FedEx has innovated and changed the way people send things. It is a great DVD for teaching Business, Economics, and Technology. Visit www.izzit.org today to order your FREE copy! If you've already ordered your Free Annual Video this year, consider upgrading to an izzitPLUS membership for only $9.95 per year. Then you'll be able to order a new FREE DVD every 30 days after leaving feedback. Learn more at www.izzit.org/join.